The Women’s Olympiad team had a warm up match against England in Amersham last weekend. It ran alongside the e2e4 tournament and consisted of four boards with one match per day using the Olympiad time control. On Saturday Wales failed to get off the score board and the team felt very disheartened as it didn’t reflect the games. Olivia played white against Natasha Regan in an Alekhine and got a knight for two pawns advantage in the middle game, but self-destructed in time trouble. Suzy played the French against Kanwal Bhatia and got an early advantage. However, Kanwal sacked a rook for an attack and sadly Suzy underestimated the strength of it. Lynda had a tough game against Maria Yurenok and slowly got ground down. Alyssa put in a great performance for her first adult International cap and had the advantage against Ann-Marie James. Sadly some back rank trouble resulted in our final loss. Sunday, Wales were off the mark! Alyssa was first to finish with a good win against a fellow junior Louise head (1760). Olivia struggled in her match playing the Budapest but held on for a draw against Maria. 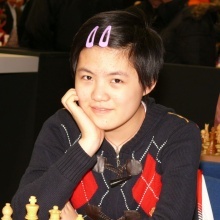 Lynda had the edge against Anna Wang throughout the game but couldn’t find a way through and settled for a draw. Suzy had good pressure out of the opening and miscalculated a winning combination and let her opponent escape, gain an advantage and slowly converted this into a win. After the match the team were disappointed by the score line but felt that we put in a good performance over the weekend and can only build on this in the Olympiad. A big thank you to Lawrence Cooper for organising the event!